“That’s why we exist,” he said. He said WAIT had been formed rather quickly, noting that he and others in the group had gotten together just several weeks prior to develop a vision and a set of principles to guide the organization. “In just two weeks more than 300 had signed our petitions to oppose the project and more than 600 had accessed a “fact-based” website one of our volunteers had developed,” he said. He added that he was speaking strictly as a concerned citizen and that all W.A.I.T. members were volunteers. He noted that Plympton-Wyoming mayor Lonnie Napper and his council had done a great job in trying to prevent the “forced implementation” of the Suncor turbines but were up against the heavy hand of Dalton McGuinty’s Green Energy Act. Next to speak was Doug Pedlar, a Huron Shores realtor. He said he became interested in the development of wind farms a short time ago when he was asked to speak to a group about their impact on property values. “Since then I’ve done a lot of research on wind farms and I’ve found that it’s one of the worst things that has happened to our rural communities,” he said. Pedlar noted that when the Ontario government brought in the Green Energy Act it claimed that electricity rates would increase by a mere one percent and that it would create 50,000 jobs. “We know that is not true,” he said, adding that on average rate hikes will be in the area of 7 per cent and the jobs created by the development of green energy would never approach that number. He added that the Green Energy Act superseded zoning by-laws and effectively took usurped the democratic rights of municipalities. “The minister of energy essentially said municipalities had no right to tell them where they can locate these turbines, you can’t stop them.” he said. for green energy, is what the Green Energy Act is really all about. “It’s called money, greed, big corporations, and more money,” he said. Peddlar said through his experience in selling real estate he knows the presence of industrial wind turbines does impact property values. He said when a wind turbine is visible from a residential property is becomes much more difficult to sell and property values can plummet anywhere from 20 to 40 per cent, depending on its proximity to a wind turbine. 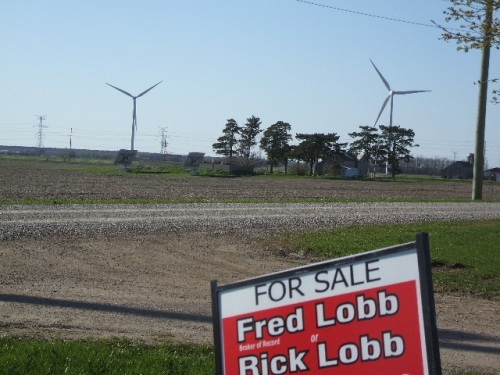 “If they can see a wind turbine it’s no fun selling properties, I can tell you that,” he said. He added that wind turbines will also impact tourism along the Lake Huron shore. “That is really going to hurt Sarnia-Lambton,” he said. W.A.I.T. member Nancy Vanhuisen told the crowd that in the near future Lambton County would be home to more than 400 industrial wind turbines and 62 of these “proposed monsters” would be located within Plympton-Wyoming. She added that the proposed turbines would be 500 feet high with blades comparable to the wings of a 747 jet. “Should a huge corporation like Suncor and a handful of landowners have to right to alter our rural landscape?” she asked rhetorically. Vanhuisen said more people are becoming concerned about the impact of wind turbines on their community and are seeking to become more informed. “People are seeking to become better informed about their impact on property values, tourism, agricultural land use, and the health and safety of their families and livestock,” she said. In addition, she said she could not understate the devastating impact the issue of wind turbines is having on relationships within the close knit community of Plympton-Wyoming, noting that some family members no longer speak because of the divisions it has created. She said recently finding confirm that wind turbines do cause health problems. She noted that the Ontario Environmental Review Tribunal hearing an appeal on the Suncor project in the Thamesville area determined that the case had successfully shown that the debate is no longer about whether wind turbines can cause harm to humans. The reports suggested that evidence presented demonstrated that they can cause harm to humans when placed too close to homes. “The debate has now evolved to one of degree,” the report stated. She noted that she was pleased that Plympton-Wyoming mayor Lonnie Napper and his council had passed a by-law requiring Suncor to post a $200,000 line of credit on each turbine to ensure proper decommissioning of the unit at the end of its life. She added that the council had also passed a by-law requiring a minimum set back of 1,000 meters for wind turbines in contrast to the Green Energy Act’s requirement of of 500 metres. “Our council has stood their ground against Suncor and compared to other municipalities in Ontario has taken the strongest front in protecting their citizens and should be applauded by all,” she said. She added that the bad news is the Green Energy Act has taken away the council’s ability to enforce those by-laws. “I strongly feel this takes away my rights as a Canadian and what we call democracy,” she said. In closing Vanhuisen had a warning for those in attendance. “Don’t come bitchin after the fact, get involved now,” she said. Also in attendance was Plympton-Wyoming mayor Lonnie Napper. He applauded the work being done by W/A.I.T. and said he was proud of the stand his council had taken. He berated the provincial government on its usurping of municipal powers under the Planning Act. “Planning should be back in the hands of the municipality where it belongs,” he said. Posted on May 3, 2012, in Cedar Point Project, Meetings, Municipalities, Property value, Suncor, Take Action, Today's Farmer. Bookmark the permalink. Leave a comment.